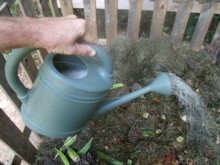 Use urine as fertilizer to help the lawn and compost pile. Using urine as fertilizer for the lawn and compost pile is a good way of easily disposing of it, plus it helps me to recycle the nutrients in urine that otherwise would have gone to waste (literally). I always add in necessary trace minerals to enrich the application. How much lawn will my urine fertilize? If you use a mulching blade (which returns nutrients to the soil) and don’t water your lawn much (watering flushes away nutrients), your lawn should only need around 100 pounds of nitrogen per acre per year. A year’s worth of urine from one adult provides this 100 pounds of nitrogen for 5,500 square feet of lawn (a 50’ x 110’ area). Lawns are much more tolerant than gardens for using urine as fertilizer, so diluting urine even 1 part to 5 parts water is generally more than sufficient. I personally like to put my “liquid nitrogen” into a watering can along with Kelp and concentrated sea minerals, add water, and spread it over a large area of lawn. After a few weeks I have covered the designated area of lawn, and then start all over again. Within a year’s time, my urine has provided my lawn with the needed 100 pounds of nitrogen per acre. Between my garden, my lawn and my compost pile, I easily utilize all my urine. It is important to supplement urine with a source of phosphorus, potassium, calcium, and trace minerals. For ideas on filling in the nutrient gaps, click here (new organic lawn care page). A compost pile needs a mix of carbon items and nitrogen items. Carbon items are brown items, like leaves, pine needles, straw, hay, wood chips and saw dust. Some common nitrogen items are food scraps, animal manure, plus green items like weeds, garden residue and grass clippings. You can use a ratio of 1 to 1, up to 1 part nitrogen items to 4 parts carbon items, as long as you have enough nitrogen to get your compost pile warm enough. nitrogen to help the compost pile reach temperatures between 135 and 150 degrees. At lower temperatures the pile doesn’t compost well, and weed seed and pathogens can survive. Human urine can provide the nitrogen needed for composting! I simply put a day’s worth of urine into my 2 gallon watering can, fill it with water, and use it to moisten my compost pile. Any time the pile gets dry, I repeat this. If urine sits for more than 24 hours the urea starts turning into ammonia. This causes the urine to stink, and makes it too strong to apply to the garden. This is a good time to use urine as fertilizer on the compost pile, since it won’t harm that. 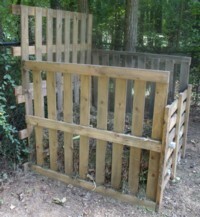 Here’s a great composting idea! Get some bales of straw or hay and wet them with undiluted urine. Do this week after week until the straw composts, then add the compost to your garden. The compost created is rich in nitrogen, phosphorus, potassium and calcium. It is lacking in trace minerals, but these can be easily added. Some people actually plant a garden right into the composted bales of straw. Please take a minute to visit my gardening home page. Happy gardening!